Directors – Mark Andrews & Brenda Chapman, Co-Director – Steve Purcell, Screenplay – Mark Andrews, Brenda Chapman, Irene Mecchi & Steve Purcell, Story – Brenda Chapman, Producer – Katharine Sarafian, Photography – Robert Anderson, Music – Patrick Doyle, Supervising Animators – Alan Barillaro & Steven Clay Hunter, Effects Supervisor – David MacCarthy, Production Design – Steve Pilcher. Production Company – Pixar Animation Studios. Merida is a princess, the eldest child of the Scottish lord Fergus. She grows up under the constantly disapproving eye of her mother Elinor, who always wants her to behave as a princess should. Merida instead prefers to be out seeking adventure and learning the use of the bow her father gave her. She is then informed that other clans are gathering because her pending betrothal has been announced and the eldest sons of the other lords are to compete for her hand. Merida refuses to accept this. Asked to choose what sport the aspirants are to engage in to win her, she chooses archery. 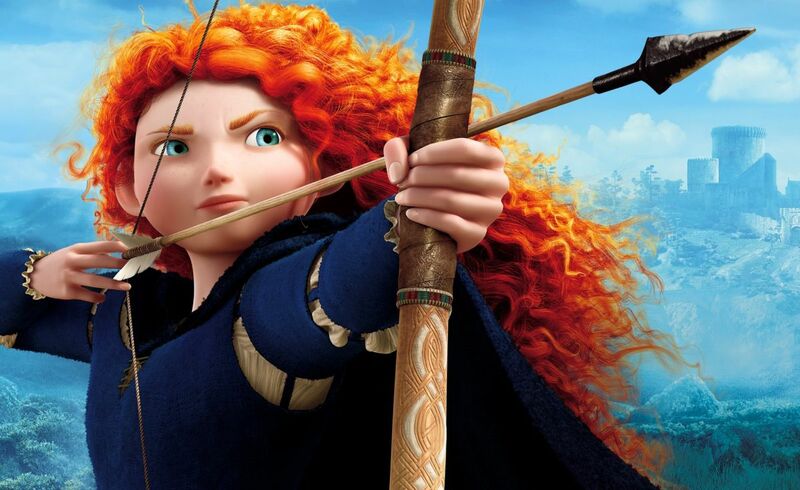 After each of the sons shoot their arrows at their targets with varying lack of competence, Merida steps up and claims the right as the eldest child to compete for her own hand, whereupon she shoots arrows that unerringly hit the dead centre of each target. She then flees into the forest. There will-of-the-wisps lead her to the house of a witch. Merida begs the witch for a spell that will change her mother’s mind and is given a cake. After feeding her mother the cake, Merida is shocked to see her transform into a bear. She is forced to hide her mother as her father starts hunting her, obsessed with tracking and killing bears ever since one bit off his leg. In the wild, Merida learns that she must heal the rift between her and her mother and stop the pending war between the clans caused by her walking away from her betrothal within two sunrises otherwise her mother’s transformation into a bear will become irreversible. Brave was the thirteenth film from Pixar Animation Studios, following the likes of Toy Story (1995), A Bug’s Life (1998), Monsters, Inc. (2001), Finding Nemo (2003), The Incredibles (2004), Cars (2006), Ratatouille (2007), Wall-E (2008), Up (2009), The Good Dinosaur (2015), Inside Out (2015) and Coco (2017), plus various sequels to these. These have all enjoyed huge box-office success and are loved by audiences and critics alike where it seems that Pixar has rarely put a foot wrong. Perhaps more so than any other cinematic genre, it seems that animated films are charged with portraying good role models for children. A few years ago, someone noticed the fact that none of Pixar’s films had featured a female leading character and asked the reasonable question of when the studio was going to provide a female protagonist. Pixar duly picked up on this and Brave was the result. They also went to the extent of hiring a female director in Brenda Chapman, as well as putting two women on the script (Chapman and former Disney writer Irene Mecchi) and allowing the film to be produced by another woman (Katharine Sarafian) – this despite the scarcity of women on the principal credits on their other films (the sole exception being Darla K. Anderson). Even then, Pixar’s attempt to portray an equal opportunities work environment did not work out as planned. Brenda Chapman quit part way through production citing ‘creative differences’ and the film was placed in the hands of Mark Andrews. Try as they might, Pixar still seems a boy’s club despite the effort made to demonstrate sexual equality here, where more than anything Brave‘s strong female presence seems something that has simply been arranged for the occasion. It can be noted that Brenda Chapman was not an in-house Pixar director – her only previous directorial outing has been as co-director on DreamWorks’ The Prince of Egypt (1998) (although she had contributed the story for Cars). Similarly, Irene Mecchi had only worked on the scripts for Disney films such as The Lion King (1994), The Hunchback of Notre Dame (1996) and Hercules (1997), and had not previously worked for Pixar. Katharine Sarafian was suddenly promoted to producer after previously being a general dogsbody on various Pixar films where her most senior position had been as an assistant producer on The Incredibles. Brave kicks in with a welcome raucousness. It has a bawdy sense of knockabout humour that is a good deal rougher and more physical than most of Pixar’s other films. This certainly gives it a great deal of energy that carries over its rougher patches. Merida, who seems identified by a wild tangle of flaming red hair more than anything else, is a modern heroine in the mould that Disney introduced from The Little Mermaid (1989) and Beauty and the Beast (1991) onwards – someone who is as capable as the men around her and stands up against social expectation rather than allows anybody to tell her what to do. Billy Connolly has equal fun as her father, giving the sort of rowdy performance that he was born to give. The animation is expectedly luscious with much placed into detailing the Scottish forests, lochs and hillsides. All of this appears to be heading towards the expected story arc of Merida standing up to defy social expectations and going away into the wilderness on a bildungsroman. Nothing outstandingly original – but then Pixar have a habit of taking familiar stories and characters and making them work with an amazing freshness. There seems something going on at Pixar akin to the same creative lunacy that infected Disney around the early 2000s where they produced such creative scratch of the head concepts as Aztec emperor turns into a llama – The Emperor’s New Groove (2000), Treasure Island (1883) in outer space – Treasure Planet (2002), a film about talking cattle – Home on the Range (2004) and one involving talking animals taking on alien invaders – Chicken Little (2005), not to mention Brother Bear itself. Why the studio would want to recycle such a loopy premise a second time around is baffling. Brave is competently made, likeable in a knockabout way, reaches a certain triumphal charge at its end but lacks the enormously endearing Pixar magic that you can point to in fairly much any of the films listed in the top paragraph. Certainly, it is hard to imagine that the film would inspire audiences to want to take Disney package tours to Scotland as are being advertising at the start of the film.